At an age when most professional dancers have given up the stage, Associate Professor of Dance E.E. Balcos can maintain a performance schedule that dancers half his age might envy. 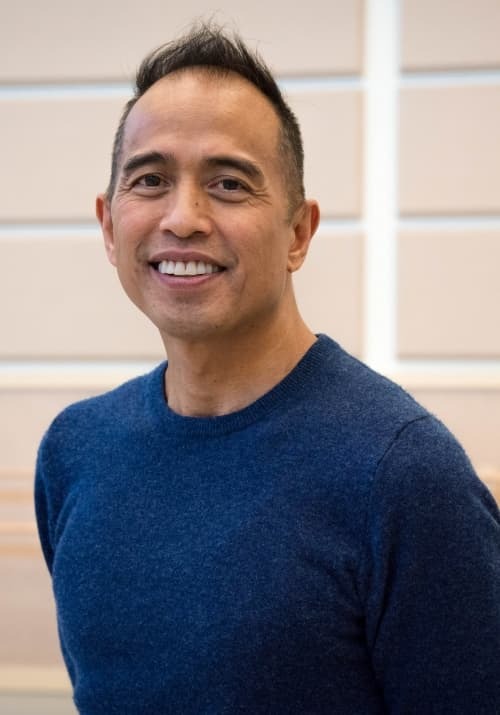 As a member of Movement Migration, a professional dance company led by his colleague, Associate Professor Kim Jones, Balcos has performed locally and in Italy and New York, including at the well-known Danspace Project in Manhattan – sometimes dancing as many as four works in a program. Balcos credits his longevity as a performer in part to his study of somatic disciplines – holistic movement practices like contact improvisation, which he began learning in college, and Alexander Technique. More recently, his research into integrated kinesthetic awareness has led to the study of Body-Mind Centering® (BMC). Founded by Bonnie Bainbridge Cohen, BMC uses movement, touch, and vocalization to deepen awareness of the whole body and its complex systems. Balcos is midway through his pursuit of certification as a Somatic Movement Educator in BMC, completing his fifth intensive course in Montreal, Canada, in August 2018. “Body-Mind Centering is helping me as a professional dancer to be holistic and healthy in an integrated way,” he says. His research has a profound impact in the studio, too. “E. E. Balcos is quietly revolutionizing the Department of Dance curriculum,” says Chair Ann Dils. His approach to teaching begins with creating “a climate of trust and inclusivity,” in which his students learn to “connect within their bodies and connect outside their bodies.” In today’s world, Balcos says, when students are often immersed in a digital or virtual environment, that human connection is especially crucial. Balcos is also becoming recognized nationally for his work in this field. In June 2018, he taught a workshop at the 33rd Annual North American Body-Mind Centering Association Conference at Smith College in Northampton, MA. The following month he performed at the 6th Annual Somatic Dance Conference at Hobart and William Smith Colleges in Geneva, NY. And he has presentations planned for the February 2019 conference of the North Carolina Dance Educators Organization, the American College Dance Association conference in March 2019, and the 34th Annual North American Body-Mind Centering Association Conference in August 2019.